Our manuals have Free Shipping and Guaranteed Lowest Prices. 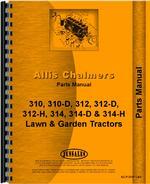 Parts, Owners and Service Manuals are typically available for your Allis Chalmers 314H Lawn & Garden Tractor. Please see availability below. Service Manual (SVC) - The service manual (a.k.a. 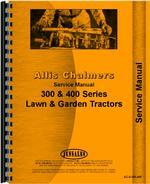 Shop manual or Repair manual) tells you how to take the Allis Chalmers Lawn & Garden Tractor apart, fix it, and put it back together. It is written in the language of a mechanic and may include valuable detailed information such as specifications, torques, ranges, etc. If you are serious about repairs or restoring, you need the service manual. Parts Manual (PTS) - The parts manual has exploded views of all parts on the Lawn & Garden Tractor giving great detail on assembly and disassembly. It also includes a guide for ordering parts. It picks up where the service manual leaves off. If you do your own repairs, you need the parts manual. Operators Manual (OPT) - The operators manual (a.k.a. 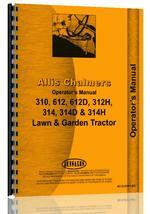 Owners manual) is the book that came OEM from the manufacturer when the Allis Chalmers 314H Lawn & Garden Tractor was purchased. It gives the owner/operator instructions, shift patterns, capacities (anti freeze, crankcase, oil, hydraulic, etc.) and adjustment procedures (brakes, clutch, etc.). This book is a critical tool for operating and maintaining your machine. Complete Kits - Get all the manuals for your 314H Lawn & Garden Tractor plus a few other perks and ensure you will not be missing critical information in the middle of your repair job. See below for availability.